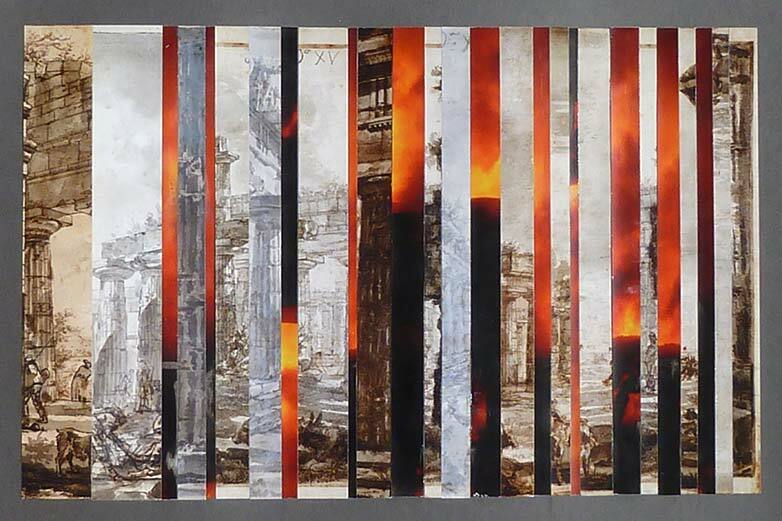 The Paestum Collages look at the imagery of ruins as fragmented memories and interleave them with a mythology of heavy industry. Facilitated by ACG curator Megakles Rogakos, Lijn explored the twelve mile road known as the Sacred Way that in Classical Greece was the processional way for the Panathenaic celebration and the Eleusian Mysteries. The ancient road from the Parthenon to Eleusis, the temple site of the Eleusian Mysteries in Ancient Greece, still exists. 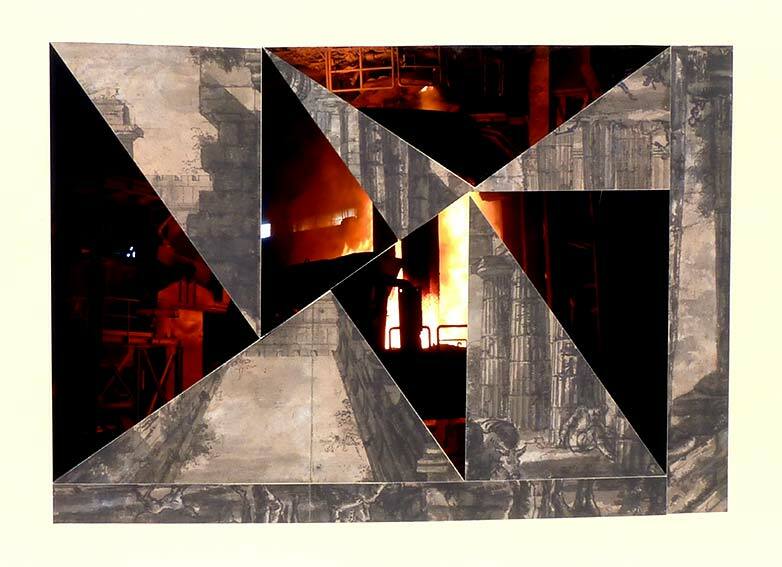 The Sacred Way now resounds to the roar of trucks and Eleusis is, since many years, a centre of Greek heavy industry. I first discovered this in the early 1960’s when I spent three years living just outside Athens. I visited the temple site of Eleusis, where Demeter entered the Underworld to retrieve her daughter Persephone from Hades. I found it surrounded by the smoking chimneys of oil refineries, steel mills, and cement factories. I was shocked and disgusted that Greece had neglected its ancient heritage so blatantly. More recently, however, I have become fascinated by the way in which industry seems often to position itself upon the very sites that were once sacred to men and women. Lijn visited two major industrial complexes, Halivourgiki Steel S.A. and Hellenic Petrol S.A., the giant state oil refinery, sited along Iera Odos ( Sacred Way), just outside Eleusis, photographing and filming both complexes. 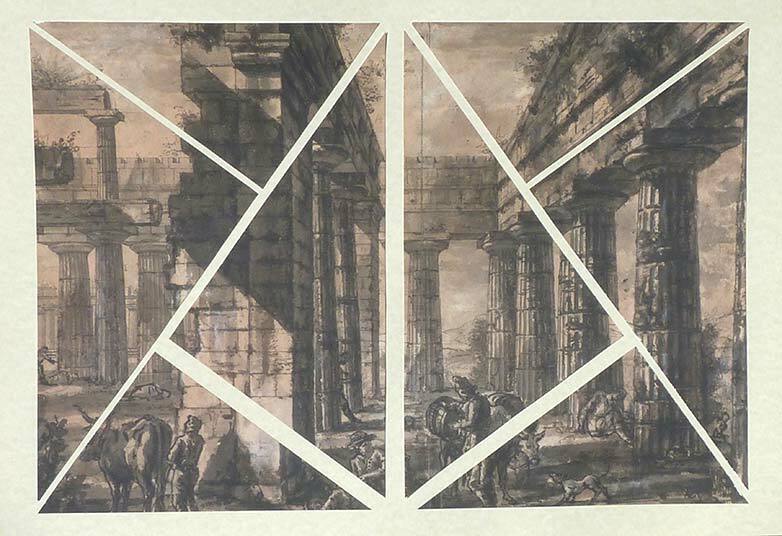 In 2011, Lijn’s exhibition at Sir John Soane’s Museum also allowed her to look through his large collection of Piranese graphic works, subsequently allowing her to use scans of his drawings of the Basilica and temples at Paestum. 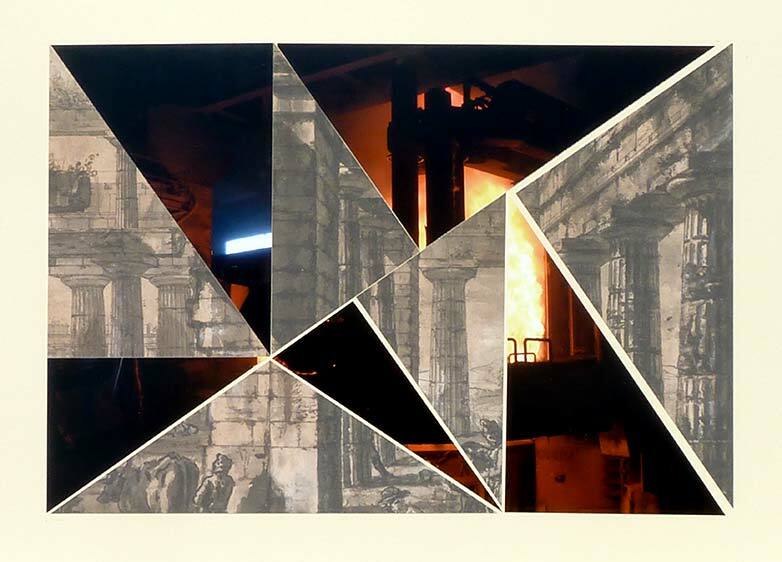 Photomontage of Piranese Temple of Poseidon with photographs of arc furnace steel smelting in Halivourgiki Steel S.A. Photographs printed on Epson high gloss acid-free photographic paper mounted on grey card. 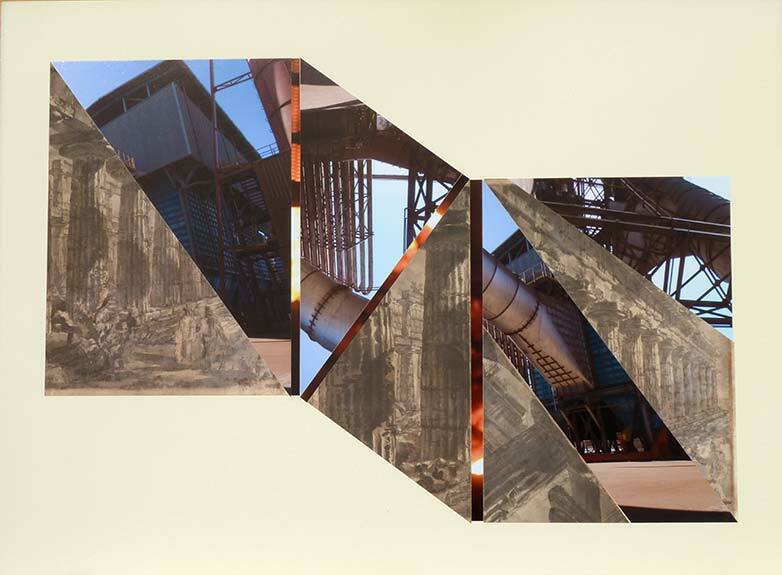 Photomontage of Piranese Temple of Poseidon with photographs of arc furnace steel smelting in Halivourgiki Steel S.A. Photographs printed on Epson high gloss acid-free photographic paper mounted on Museum board. 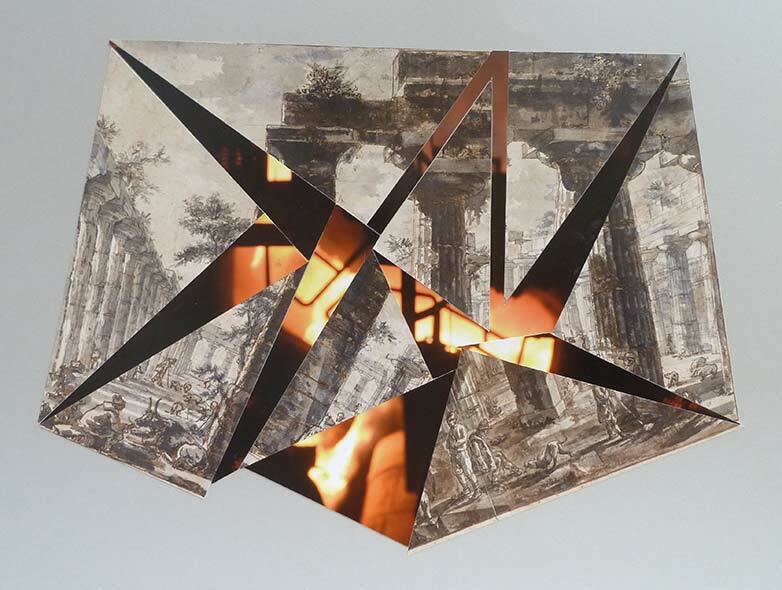 Photomontage of Piranese Temple of Poseidon with photographs of arc furnace steel smelting in Halivourgiki Steel S.A. Photographs printed on acid-free Oyster paper, digital scans on acid-free Somerset and mounted on archival Museum board. mounted on Fabbriano museum board. 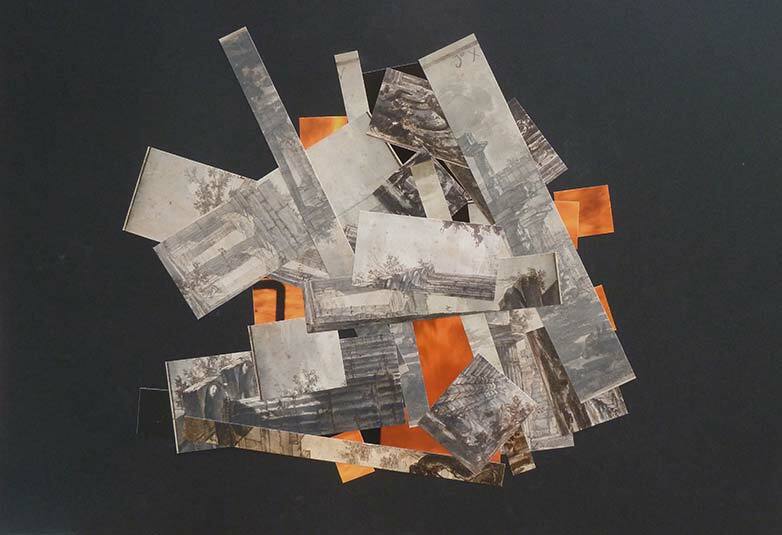 Nine layer collage of photographs of Halivourgiki Steel S.A. and Piranese Temples of Paestum mounted on black acid-free card. 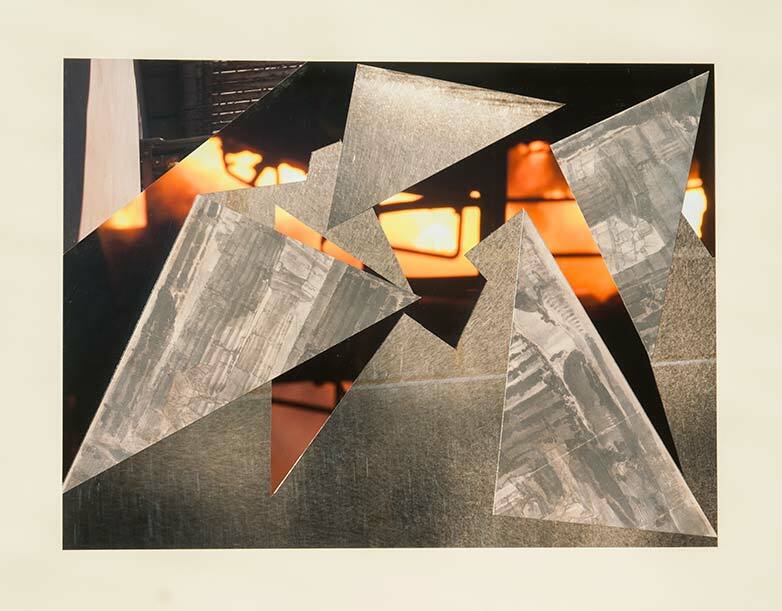 Cut-out of Piranese Temple of Poseidon positioned on photograph taken in Halivourki steel mill, unmounted. 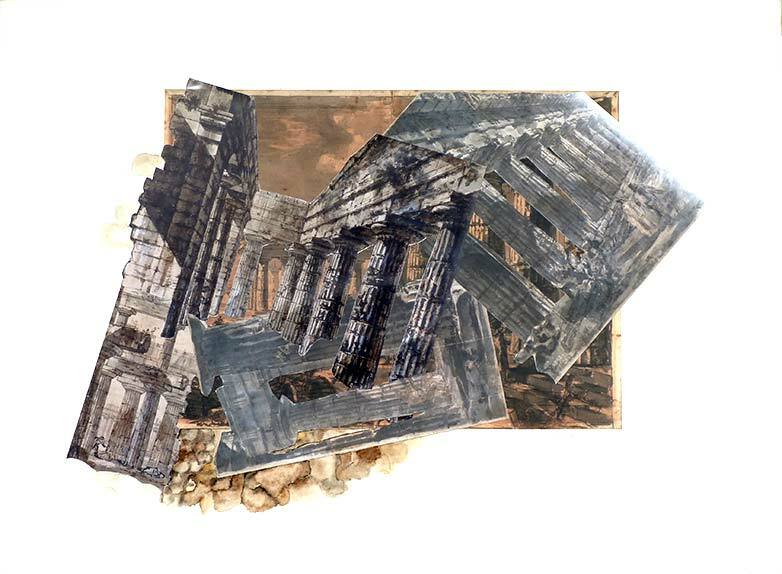 Photomontage of Piranese Temple of Poseidon with photographs of Halivourgiki Steel S.A. Photographs printed on acid-free Oyster paper, digital scans on acid-free Somerset and mounted on archival Museum board. Original photo–montage of Lijn photographs of Halivourgiki Steel S.A. on the Sacred Way, Eleusis, Greece and scans of Piranese Temple of Neptune in Paestum, Italy. Can also be had as a giclé digital print, edition of 15. Also featured in Very Magazine. Liliane Lijn’s recent work as featured in her Lightyears exhibitions is featured in a four page article in Very Magazine 16. 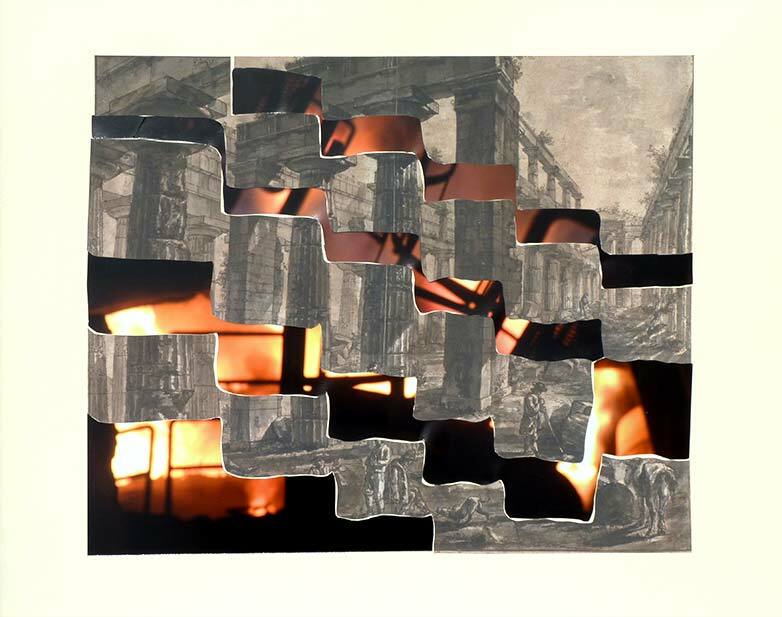 Her Nine Layer collage animation is featured in the Very iPad. 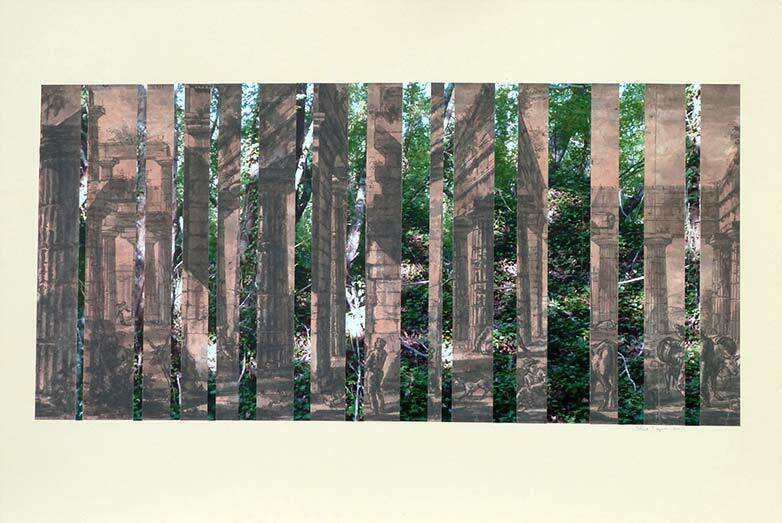 Original photo–montage of Lijn photographs of Umbrian woods and scans of Piranese Temple of Neptune in Paestum, Italy. 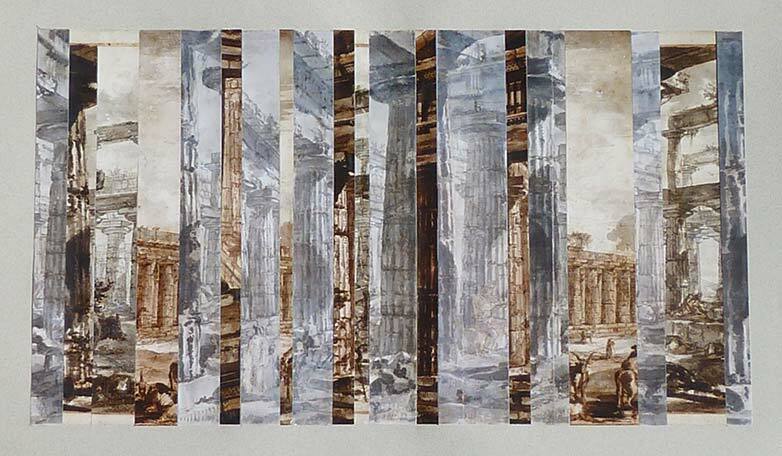 Cut-up of digital scans of Piranese Basilica of Paestum printed on acid-free Somerset enhanced Satin 225gsm and mounted on a vellum card. 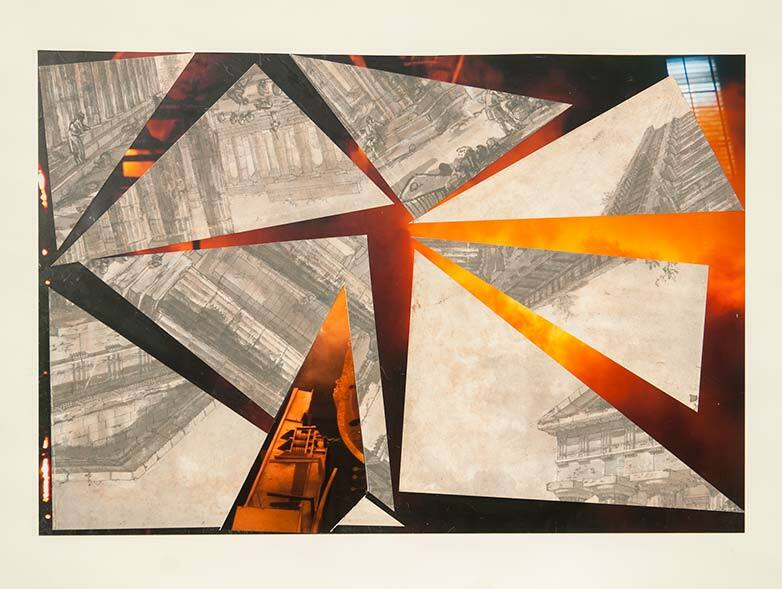 Photomontage of Piranese Basilica and Temples of Poseidon printed on Epson high gloss acid-free photographic paper mounted on white board. 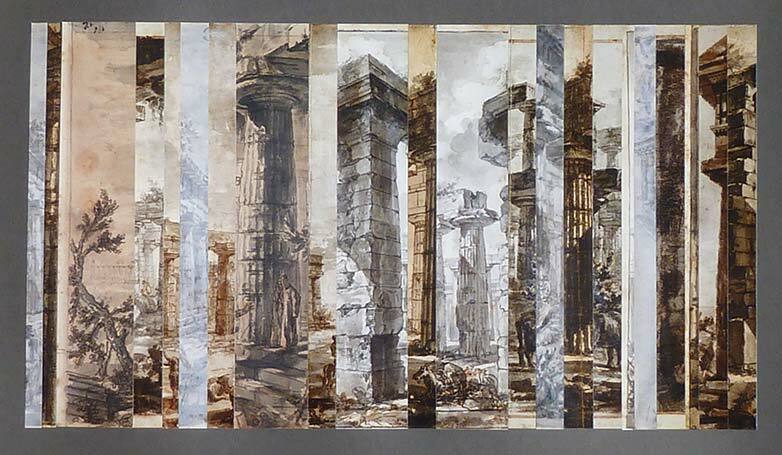 Photomontage of Piranese Basilica and Temples of Poseidon printed on Epson high gloss acid-free photographic paper mounted on grey card. Photomontage of Piranese Basilica and Temples of Poseidon printed on Epson high gloss acid-free photographic paper mounted on black card. 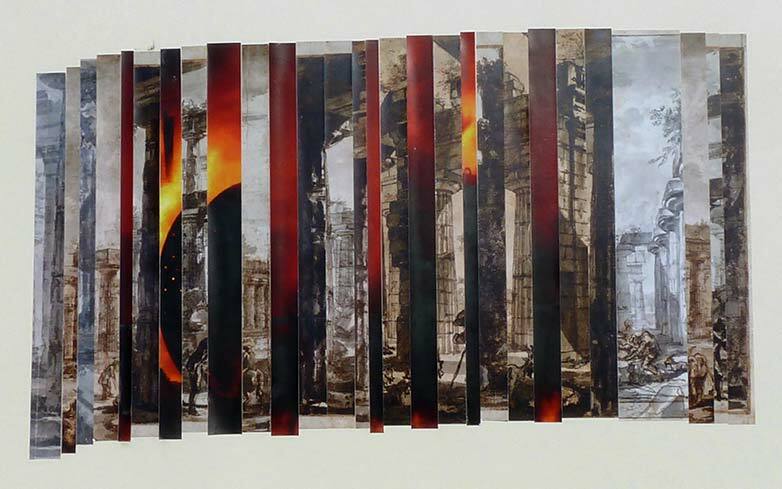 Photomontage of Piranese Basilica and Temples of Poseidon and Lijn photographs of Halivourgiki Steel S.A., Eleusis, printed on Epson high gloss acid-free photographic paper mounted on black card. 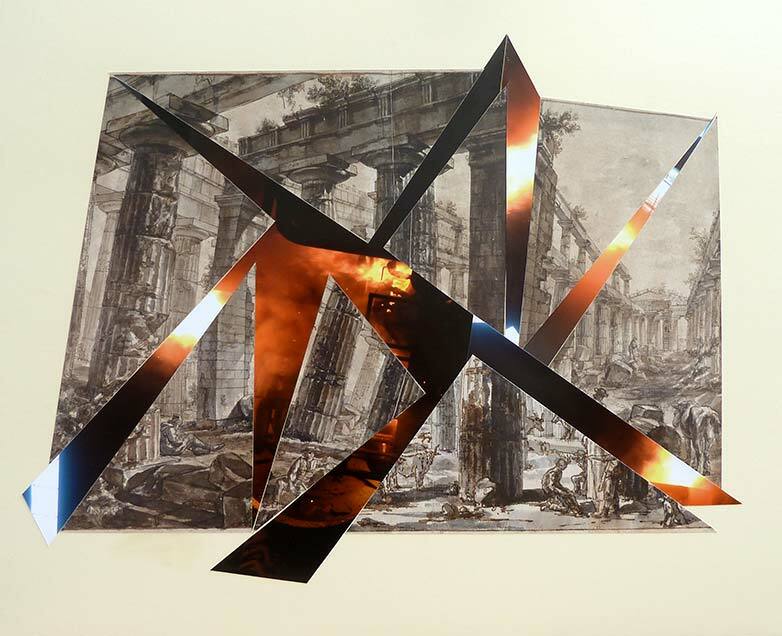 Photo–montage of Lijn photographs of Halivourgiki Steel S.A. and Hellenic Petrol S.A. on the Sacred Way, Eleusis, Greece and scans of Piranese Temple of Neptune in Paestum. 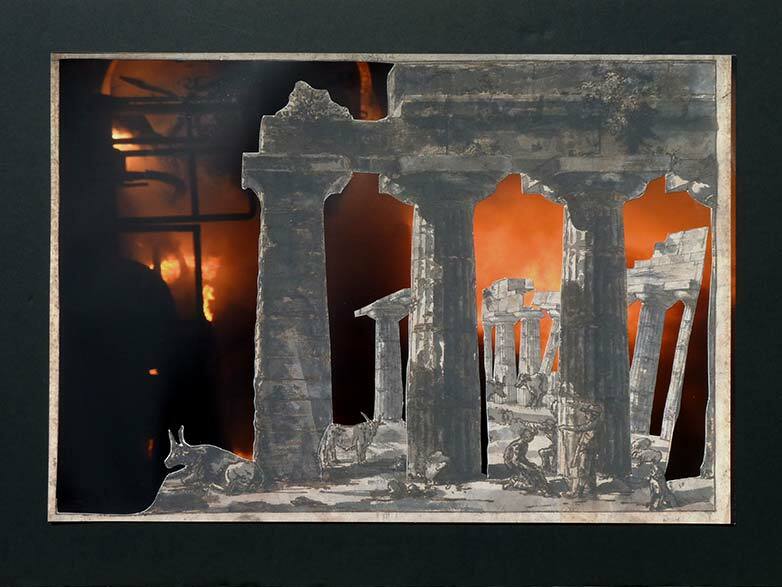 Photo–montage of Lijn photographs of Halivourgiki Steel S.A. on the Sacred Way, Eleusis, Greece and scans of Piranese Temple of Neptune in Paestum. 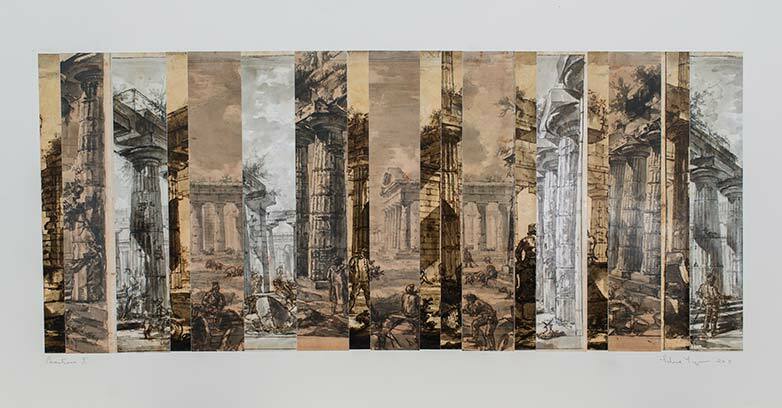 All scans of the original Piranesi graphic works, courtesy of the Sir John Soane’s Museum. 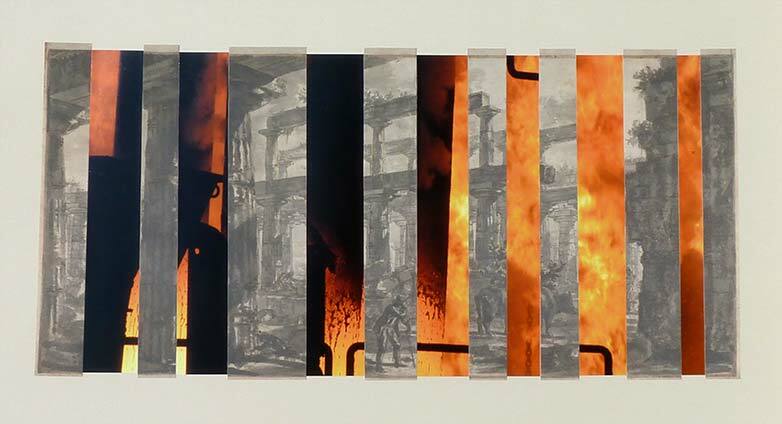 credit Stephen Weiss, Richard Wilding, courtesy of the artist.